Jackson Hole is a valley in west-central Wyoming that today provides numerous attractions to millions of visitors each year. 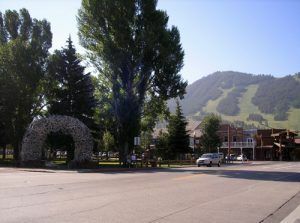 The Jackson Hole Mountain Resort and Grand Targhee ski areas, and nearby Grand Teton and Yellowstone National Parks are major tourism attractions year round. Native American hunting parties from the northern Rocky Mountains camped along the shore of Jackson Lake around 12,000 years ago while following game. For thousands of years Jackson Hole was used as a neutral crossroads for trade and travel routes in the area. One route followed the Snake River to its source in the Yellowstone area. Another major route traversed the Teton Pass at the southern end of the range, providing a shortcut to the Pacific Northwest region. Numerous archeological remains have been found that portray the long history of those native peoples, including cook pots and obsidian tools. During these pre-historic times, no one tribe claimed ownership to Jackson Hole, but Blackfoot, Crow, Gros Ventre, Shoshone and other Native Americans utilized the valley as a summer camp. John Colter, a member of the Lewis and Clark Expedition is the first white man known to have visited the area now known as Jackson Hole as early as 1806. 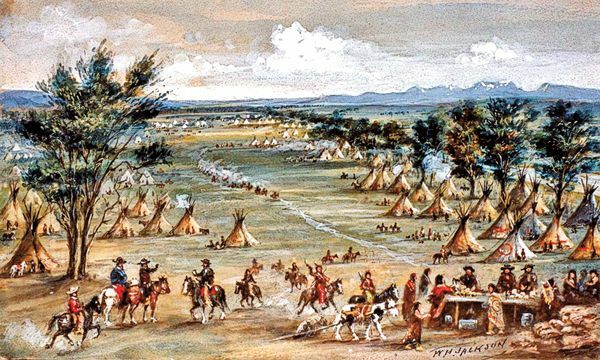 100 enterprising young men to ascend the Missouri River to the Rocky Mountains, there to be employed as hunters. As compensation to each man fit for such business, $200 per annum to be given for his services. Jackson soon took a job with William Ashley’s Rocky Mountain Fur Company. However, in 1826, he and two other fur trappers, Jedediah Smith and William Sublette, bought out Ashley. By 1830, the trio had made a good profit and sold the company. The valley was named for Jackson, was first called Jackson’s Hole, in about 1829. The “hole” came from early trappers who primarily entered the valley from the north and east descending along relatively steep slopes, giving the feeling of entering a hole. By 1845, the fur trade declined and the valley was virtually left alone by white settlers until geologist F.V. Hayden visited the area in 1860 as part of the Raynolds Expedition. In the summer of 1871, he led the first government-sponsored scientific survey of the Yellowstone area just to the north. Though the Homestead Act was passed in 1862, pioneers didn’t inhabit the valley until 1883 when John Holland and John and Millie Carns became the first settlers. Living alongside the Indians who continued to utilize the valley as a summer camp, pioneers continued to come including a sizable influx of Mormon settlers in the late 19th century. By the mid-1890s, several villages had sprouted up by the names of Kelly, Wilson, Moose, Moran, and Jackson. Officially laid out in 1897, Jackson soon sported a bank and a number of stores around the town square, some of which continue to stand today. Historic buildings at Menor’s Ferry in the town of Moose also continue to stand. The inhospitable climate and limited growing season soon caused many of the homesteaders to sell out, and much of the land was consolidated into large ranches. As the cattle industry thrived, the large herds of Elk began to suffer as they competed with the cattle for food. 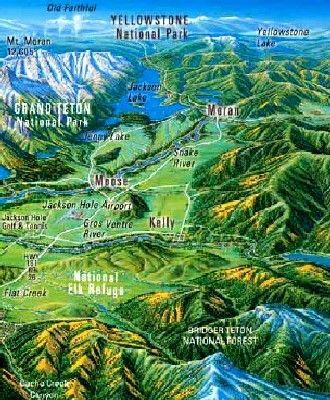 In 1910, the federal government bought the more than 24,000 acres just north of Jackson and created the National Elk Refuge to preserve both the wildlife and the ranching lifestyle of Jackson Hole. 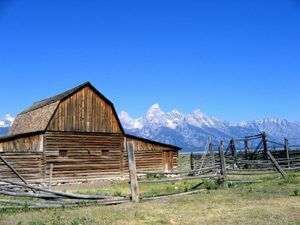 Early in the 20th century, settlers also realized the potential in the area for big game hunting, providing housing and services to a new league of tourism, which soon replaced cattle ranching as Jackson Hole’s economic base. When Yellowstone was designated as the nation’s first national park, Jackson Hole really began to attract visitors, further increasing its tourism. Visitors once again climbed when the area surround the Grand Tetons was designated as a national monument in 1929. After years of debate as to whether the Tetons should be added to the Yellowstone National Park, congress added further acreage and created Grand Teton National Park in 1950. The Grand Teton National Park occupies the western half of valley along with the mountains for which the park is named. Jackson Lake is in the northern part of the valley and the town of Jackson, Wyoming is at the southern end. The average altitude of the valley is over 6,500 feet. The only incorporated town in the valley is Jackson, sometimes also mistakenly called Jackson Hole. Other communities in the valley include Wilson, Teton Village, Moran Junction, Hoback, Moose, and Kelly. Today, Jackson Hole is one of the country’s most popular destinations for outdoorsmen and tourists alike. With a unique culture, blending its western heritage with that of a destination resort, visitors from all over the world are drawn to its incomparable natural beauty, a wide variety of outdoor activities, galleries, and festivals. Outdoor activities include skiing, snowboarding, wildlife viewing, hiking, rock climbing, horseback riding, mountain biking, fishing, kayaking, and more.